Local rock fans can certainly recognize the line “I bleed for you like a new tattoo” which was made popular by a then unknown Cebu indie band Urban Dub which has already made it big because of this album. The song came to mind when I got inked with my 2nd tattoo which was borne out of wanting something that would remind me of what I usually lack when I feel lost in this game called life. I got acquainted with the tattoo artist because of my sibling who got her 1st tattoo recently. With some prodding to add a new one, I finally chose the Kanji script for Faith/Believe, thinking that as it would be a part of my body for the rest of my life, I should choose something relevant for myself that should be applicable until I’m in my death bed. I kind of forgot how it hurt the 1st time I got inked and was kind of biting my lip as the tattoo artist started outlining the script. Then after a few minutes, my body adjusted to the pain. 20 minutes later he was done. I got the usual inflammation which was a reminder for me that I couldn’t get a half-sleeve inked on my arm as that would be one painful recovery phase for me because I have this hyper-sensitivity in my skin that traumatizes easily. It’s been a week now and as I write this at home in Davao Imperial Hotel, my small tattoo has been steadily healing. I can see the scabs fall off and by next week I could hit the beach again! 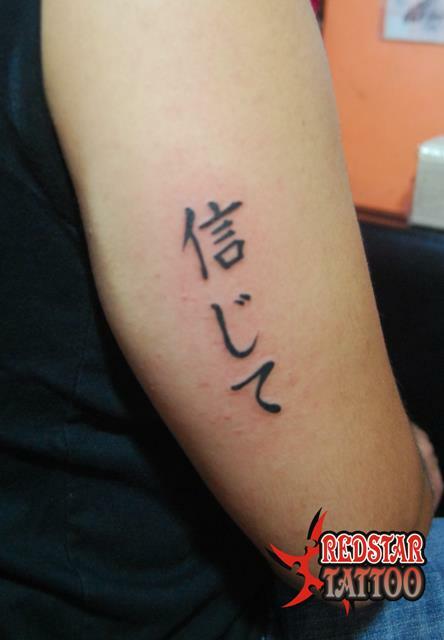 This entry was posted in Uncategorized and tagged Davao, davao imperial hotel, Hotel, redstar, tattoo by moonman0903. Bookmark the permalink.